when you order 10 or more! 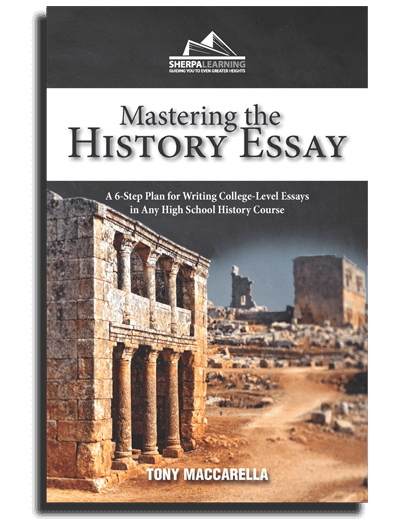 Mastering the Essay is an AP* History supplement, focused on building college-level essay-writing skills through a proven step-by-step writing process. The AP* World History Edition utilizes practice exercises that directly respond to the newly redesigned College Board recommended AP World History course outline. This edition was updated in 2017 to prepare students for the 2018 AP* World History exam. INSTRUCTIONAL HANDBOOK — A guide to writing high-scoring DBQ and LEQ essays, the Handbook is divided into units that parallel the writing process. Students learn to write excellent essays by building their writing skills one step at a time, from the thesis to the closing paragraph. The Handbook also focuses on developing a strong understanding of the rubrics, and includes instruction on document analysis, source-based multiple-choice questions, and short-answer questions. EXERCISE WORKBOOK — The Workbook includes 9 sets of 8 exercises, each modeled after an exercise format introduced in the Guided Practice activities in the Instructional Handbook. Every set of exercises includes items covering each of the Historical Time Periods. The Workbook also includes MCQ and SAQ exercise sets, "Practice Tests" for the writing components of the exam, and detailed answers and explanations for every exercise. SOURCE-BASED MULTIPLE-CHOICE AND SHORT-ANSWER QUESTION SKILLS AND EXERCISES! What’s the biggest challenge faced by your AP World History students this year? As they begin to master the content, you will find that writing clear, direct, persuasive essays is their biggest challenge—and the most important skill for them to master. Our biggest challenge, as teachers of AP World History, is trying to help them develop their essay writing skills without sacrificing valuable time needed for content instruction. That’s where Mastering the Essay comes in. Mastering the Essay was designed to help students learn to write clear, direct, persuasive essays in the context of their AP World History course. That means, as their teacher, you can teach writing skills AND content within the same class period. Impossible, you say? Check out the table of contents in the downloadable sample. No matter what content you happen to be teaching, Mastering the Essay has a writing exercise for your students—regardless of their current skill-level. Mastering the Essay aims to change the way we teach writing skills within our AP World History classes, and Sherpa Learning aims to change how educational resources are developed. We want to provide resources that help you to help your students without adding more hours to your already overloaded work schedule, AND we want those resources to reflect your needs by involving you at every step along the way. Join our team to help us develop and test exciting, new content! Tony Maccarella, or as students past and present call him, “Mr. Mac,” has been teaching social studies since 1982, and is currently teaching AP World History and AP Macroeconomics at Saddle River Day School, in Saddle River, NJ. Prior to this, he taught AP European History at Parsippany Hills High School, in Parsippany, NJ for over 10 years. Additionally, Mr. Mac has taught AP U.S. History, Comparative Governments, Anthropology, Psychology, Microeconomics, and Military History. Since 2002, Tony has served as a Reader and Table Leader for the AP European History exam for ETS. He is responsible for scoring AP European History exam questions, supervising other readers, and assisting with the clarification of scoring standards. You may also run into Tony at one of the many guest lecturer appearances he makes at social studies conference across the Northeast. Tony is an avid traveler. He has bicycled across the United States, motorcycled to Sturgis and back, studied in China, and traveled throughout Italy with his wife, family, and students from seven different European History classes.